Why would I need self storage in Charlotte, NC? There are a variety of reasons why you might need self-storage in Charlotte, NC. How much is a storage unit in Charlotte, NC? The cheapest storage unit in Charlotte, NC is $14.00 per month. What size storage units do you have available in Charlotte, NC? In Charlotte, NC we have sizes that range from 3'x3' to 18'x55' to suit your storage needs. How much is it for a 3'x3' storage unit in Charlotte, NC? The cheapest 3'x3' storage unit in Charlotte, NC is $18.00 per month. Charlotte is one of the largest cities in the southern United States, and is among the fastest-growing in the country as well, with a robust corporate-based economy. It's home to some of the biggest financial institutions in America, including Bank of America, Lending Tree and Wells Fargo, and is also the home base of NASCAR and Joe Gibbs Racing. The area that's known as Charlotte today was home to Native American tribes for thousands of years, with European settlers arriving in the mid-1700s. Not long after that, the town sparked the first American Gold Rush, set off by the discovery of a 17-pound gold chunk that a Charlotte family had been using as a doorstop. Located atop two large gold mines, Charlotte became the center of gold production for the United States for quite some time, and eventually grew even more successful thanks to cotton and railroad booms. Charlotte's downtown area is a thriving metropolitan center with many options for entertainment, arts and dining. The city also boasts a thriving sports scene with several professional teams, including the NFL's Carolina Panthers and the NBA's Charlotte Hornets. Both teams have been contenders for championships. It's also a hub for NASCAR racing, and hosts two major races every year. There's no shortage of culture and special events in Charlotte. You can browse collections of modern art, historical artifacts and even sports memorabilia in the city's many museums. One of the United States' largest renaissance festivals takes place in Charlotte every year, offering a trip back to medieval times while shopping, dining and enjoying live performances in the company of kings and queens. The city's also home to a diverse educational center revolving around UNC Charlotte, which is part of the southern medical research triangle. UNC Charlotte produces studies, breakthroughs and new developments in multiple fields of medicine, including cancer research. Many energy, automotive, entertainment and retail companies also call Charlotte their headquarters. Thanks to this diversified economy, Charlotte offers a wide range of opportunities in a number of different industries. Hundreds of years ago, Uptown was the site of a major Native American trading post. Today, it's still a center of activity, filled with towering skyscrapers and a variety of restaurants and taverns where you can grab a bite after a long day at the office. As soon as you arrive in Plaza Midwood, the quirky graffiti murals and unique blend of businesses will make it clear that it's a neighborhood unlike any other in Charlotte. The community is known for its many events, including the 4th of July Pig Pickin’, a celebration of barbecue, live music and craft beer. This neighborhood is anchored by the University of North Carolina at Charlotte, and has a vibrant college town spirit that especially comes alive during the fall football season. Dilworth is a picturesque historical neighborhood, and was Charlotte's very first streetcar suburb in the 1890s. The area has a cozy, hometown vibe that's exemplified by its white picket fences and old-fashioned bungalows. Charlotte is in the South, so it's hot during the summer months, with temperatures regularly reaching into the 80s and 90s. In mid-summer, temperatures can jump into the 100-degree range, and the humidity is often high. Charlotte regularly experiences wet weather thanks to its location just north of the Gulf of Mexico. The subtropical moisture tends to fall on the city in the form of rain, especially in the spring months. In the fall, rains are less frequent, but hurricanes are a possibility. You should be aware that your home might be in a flood zone due to the wet weather in Charlotte, which means paying higher insurance premiums. You can avoid this situation by requesting flood zone information before choosing a new home. Charlotte's public schools are managed by the award-winning Charlotte-Mecklenburg Schools system, offering elementary and secondary education. If you're interested in a private school education for your children, the city has many options, including schools that provide specific study tracks, such as fine arts. If you're looking to pursue higher education, you have your pick of many colleges and universities located both in the city and in its suburbs. The University of North Carolina at Charlotte, Davidson College and Central Piedmont Community College are just a few of the institutions that the area has to offer. Power and Water: Duke Power is the main company that provides electricity services in Charlotte. You can use their online system to start and stop service and pay your monthly bill. The City of Charlotte manages all residential water services. Garbage and Recycling: The City of Charlotte's Solid Waste Division provides weekly curbside pick-up of your trash and recyclables. Keep in mind that if you're planning to do some yard cleanup at your new residence, you'll need to request a special bin for trimmings. Transportation: Charlotte and its suburbs have a wide range of public transit options for you to utilize, provided by the Charlotte Area Transit System (CART). Get around town by hopping on the light rail, taking a bus or express shuttle or even riding on one of the city's historical trolleys. Cable TV and Internet Services: You have your pick of four companies that offer varying combinations of television and internet services: AT&T, Spectrum, DirecTV and Dish TV. Our lowest priced units in Charlotte, NC average $37.68 per month. 1920 people have reserved units in Charlotte, NC in the past 30 days. 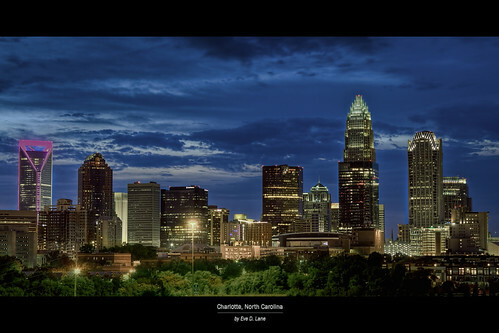 There are 37 locations within Charlotte, NC's city limits. There are 26 locations in Charlotte, NC that offer AC and Heating features.